There are 5 stages of grief: Denial and isolation, anger, bargaining, depression, and acceptance. Not sure which stage I’m currently in. I seem to vacillate between isolation and depression. Acceptance, my friends…seems far away. But before we get there let’s talk about the last month. One word: whirlwind. Because I could no longer wait on my insurance company to accept my newer surgeon at the wound care center I saw my original surgeon who had opened me up and put the wound vac inside of me way back in May. I was comfortable with him and felt his skillset was appropriate for me since we had history. I saw him in early October and after a somewhat painful examination we decided on a flap enclosure procedure. He would take out some of the tissue so my thigh and hip would heal naturally it wouldn’t have gaps in the contour of my thigh and hip He said he’d scrape me out as necessary and stitch and staple me to pieces. I was sent away from the office with the advice that I’d hear from the scheduler once my insurance approved the surgery. The following week I get a call on Thursday saying I’m scheduled for surgery the very next Monday, October 21st. GAH. Left me no time at all to get anything ready for the following Monday. I had to leave work early that day and go to the hospital so I could get blood work done. It ended up being a mess due to the way the lab is setup after certain time frames but it ended up ok, just took longer than I wanted. Friday I was a mess trying to get things done, put things on hold, ask some of my colleagues to take care of certain things for me. I realized I don’t run the country so some things would have to go undone for a while and that’s that. Afterall, we were only talking a few weeks. Saturday I skipped going to my parents’ house so I could do some work but took time out for a brow wax and manicure/pedicure in time for Halloween and in particular the next days pumpkin patch. On Sunday we got to the pumpkin patch, meeting several groups of friends with their kids and I used the old lady rollator with the knowledge I’d sit, I’d walk where I could, I’d do what I could. But at least I’d be there. What got me through the day was knowing that no matter how much pain I was in the next day I’d have as much anesthesia and pain meds to make me forget. Bright and early the next morning dad showed up. I showered, fixed my hair and dressed then off to Mount Vernon we headed. I signed in and was immediately taken back where all the usual went through, insurance, id information, assorted forms had to be signed and information given. Then a nurse got me and we went through the vitals, a urine test, talked about my wound history, got way more sympathy from this sweet nurse than I deserved. She couldn’t draw blood, tried twice, and then took me into pre-op and I ran into the Anesthesiologist who I knew could do my blood draw. Well this time as it turned out he was enroute to the OR but stopped and stayed with me to get my blood draw and IV put in. YAY. I waited not so patiently for my surgeon (I asked if I could take a picture of his giant hands because I told him no one would believe me that his hands were like giant baseball mitts). He told me he was at about 80-85% confidence of surgical success which was down from 90%. Guess he had time to plan and think things through. There wasn’t much I could do. This was my chance. Plus he had knowledge of my body and wound. Finally things began moving along, dad kissed my forehead and I was wheeled into the OR. I got all worried about having to move to the other table when they promised me they’d move me then the anesthesiologist put a mask over my face, told me to stop talking and inhale deeply. When I woke in recovery, fiery pain shooting down my leg. I was given meds twice for the pain and then moved up to my room. This time I wasn’t in a private room. Boo. I could go into the boring details. My nurse was kind and gracious about getting me settled in. Dad sat near me and made sure my nurse and the staff paid appropriate attention to me. I hurt a lot but very quickly found out that my wound care surgeon and my hip surgeon had very different ideas of pain management. Yea. Wow. Bright and chipper the next morning my nurse removed my catheter. Immediately I had to pee and she assured me I did not. I asked her to let me just walk to the bathroom and try. It was then I discovered I was on bedrest and bedrest meant no trips to the bathroom. It meant bedpans. Yikes. Soon after she left I dozed off and then heard a mans voice. Turns out it was my hip surgeon, Dr. Fricka. And suddenly I learned what had happened the day before. During surgery as my surgeon cleaned out and removed tissue and tightened things up, my surgeon while feeling around for my new hip discovered what he described (to my dad) as a ‘puddle of goo’ (when I asked him to elaborate during my follow-up he said it was just best described as good, a mushy goo pocket. Nice, right?). Well he couldn’t feel my new hip and ran into this goo puddle and stopped working to see if my hip surgeon was available. As it turned out, my hip surgeon had just finished surgery so he scrubbed in and helped out. Between the two of them, neither could feel my new hip. 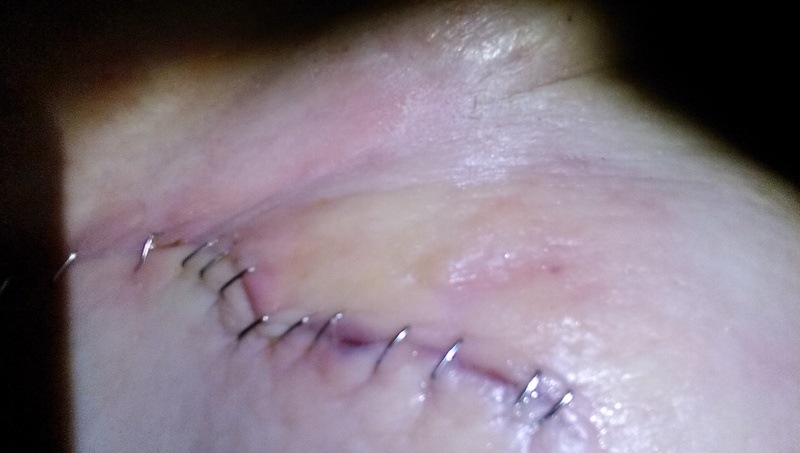 Cultures were taken and I was sewn internally with 3 different layers of stitches and then stapled together externally with 30 staples and set off to bedrest to recover. As my hip surgeon spoke, I held back tears and tried to ask questions but I was so confused. The idea that I had an infection hadn’t occurred to me. He became incensed when he found out the Infectious Disease doctors office refused to call me back and sent off a message right then from his phone. I’d only been off the antibiotics 3 maybe 4 weeks tops. He didn’t know if I was truly infected yet since they had the samples at the lab but he talked about infected implants and more surgery and suddenly I felt very small and everything else started to get very large. It was more than I could bear at that moment. I did feel good knowing he’d had a hand in my surgery but I didn’t feel good with all the unknowns. I had planned to elaborate on some of the funnier parts of my stay but to be honest today is not a good day for me. I woke up crying and I’m overwhelmed and upset and way too many things to count. Maybe I will relay them later. Those of my Facebook friends know most of the funny stuff that happened. Here’s where it left off between the two surgeons: I have 2 bacterial infections. 2 of the original ones I had. The goo filled area is way towards the back of where I was being treated, not where I was being treated already…which is why nobody thought there was an issue. My new hip is infected but they didn’t take drastic measures that would make it impossible to remove or work with in the future. For now though, it is infected. I was sent home with a PICC line (Pixie the Second) and IV antibiotics not once, not twice, but three times a day. It’s insane. I spend all day worried about taking antibiotics. Both surgeons told me in order to keep my hip in I would likely be on oral antibiotics for the rest of my life. If they take it out, I think they can put in a spacer or something but the thing is…with the issues I’ve had here? No one is excited about removing the hip to put in a new one AFTER I’m infection free…and God only knows how long that will take. Yea I need to stop for now. I’ll write more later. And yea, a small sample of what part of my staples look like. Hideous. Absolutely hideous. This entry was posted in Uncategorized and tagged aplastic necrosis, chronic pain, depression, dysplastic, infected implants, INOVA, mouth vernon inova, staph infection, THR, Total Hip Replacement, wound care. Bookmark the permalink. It is amazing what you have gone through. Anyone who has gone through life threatening issues will understand how amazing it is. I will share a couple of thoughts to remember. First, my Mom once said, “remember, it’s called practicing medicine” (In other words, they don’t always know). Second, Dr. Oz. once was asked about recovery stats. He said without doubt, he has seen patients (heart surgery) that should not have made it and patients he felt had an excellent chance of survival. Yet, many times, the outcome was the opposite. It not only depends on the individual, but their support system and loved ones. He truly believes having someone to live for and love gives you a major edge in your recovery. I believe that 100%! Twenty-six years ago I had peritonitis….I definitely died at one point. I was watching (from above) the paramedics and heard them say “no BP”, I kept fainting in the ER and saw my Grandmother who had died 18 years earlier. After being rushed into surgery and days later walking the hall of the hospital, the doctor who operated on me said, “I have never operated on someone with so much infection and lived”. I didn’t even flinch, I said, “I have three girls at home that need me”. I have never forgotten that. You are lucky…you are not alone…you are loved….you have someone to love… Baby steps, baby steps….it’s not easy, but worth it. Reading it all together like that makes it just seem so undeniably horrifying. I can’t believe all you’ve been through and how strong you are. You are the bravest and strongest person I know.